REMBAU: Malaysia’s chicken producers must team up to boost production and intensify exports to become a global player as well as strengthen national food security. Deputy Prime Minister Datuk Seri Dr Ahmad Zahid Hamidi said Malaysia is a net exporter of chicken, churning 1.5 million chickens a day worth RM10 billion a year, but only 7 per cent is exported. “Malaysia’s chicken production already has a self sufficiency of 182 per cent and yet the chicken producers are not exporting enough. “I want all chicken producers especially those listed on Bursa Malaysia to team up and boost exports to 30 per cent by 2030 and also work together to beef up food security in the country,” Zahid said here today at the launch of the HyFresh new chicken processing facilities. Zahid said although Malaysia is a major net exporter of chicken among Asean nations, the country still cannot control the halal market. “Malaysia’s halal certification is among the most recognized and sought after in the world but yet we are not among the top producers of halal chicken. “Many countries such as Japan and South Korea want halal certification from Malaysia and they want halal products and certification from Malaysia to be brought at international events. 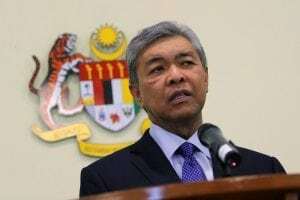 Zahid said that the international community knows that halal food is not just for Muslims but for all as it is clean and pure with its own standard operating procedure. Zahid said chicken producers must also strategise to hedge the purchase of imported chicken feed which can be expensive due to currency fluctuations. “I know the cost of imported corn is expensive but by hedging, chicken producers can cut cost in the long term. I was once involved in the chicken processing industry so I know,” said Zahid. He said Malaysia must intensify chicken production as Malaysia’s chicken production per capita is low compared to Thailand (11.6kg) and Indonesia (6kg). He added that chicken production must also be ramped up to strengthen national food security and it is also the cheapest source of protein for the people. “But I hope that the methods adhere to international standards and the chickens are not injected with growth hormones which can be detrimental to the health of the people. Zahid also commended the HyFresh management as they are able to shorten the life cycle of their chickens encompassing from the hatching of the eggs to slaughter to 30 days from 90 days.